The ratio of volume occupied by hydrated cement paste to the aggregated volume of capillary pores and hydrated cement paste is known as gel/space ratio. It is denoted by r. Powers (1958) found that compressive strength of concrete is 34000 r3 psi (234 r3 MPa) and interestingly he found no influence of mix proportion of concrete and age of it on strength prediction. To realize the definition and significance of gel/space ratio it is required to discuss about volume of hydration product. The respective figures of C3AF and C3A are 37 and 40 percent. Equation (1) is also vary approximately due to our inadequate knowledge of stoichiometry of the hydration products and cannot be ascertained the amount of chemically combined water. Non-evaporable water determined under specific conditions is considered as 23% if anhydrous cement (measured by mass); in case of type II, moderate sulfate resistant cement, this value may be 18%. The specific gravity of hydration products of cement becomes such that the resulting volume is more than absolute volume of anhydrous cement. 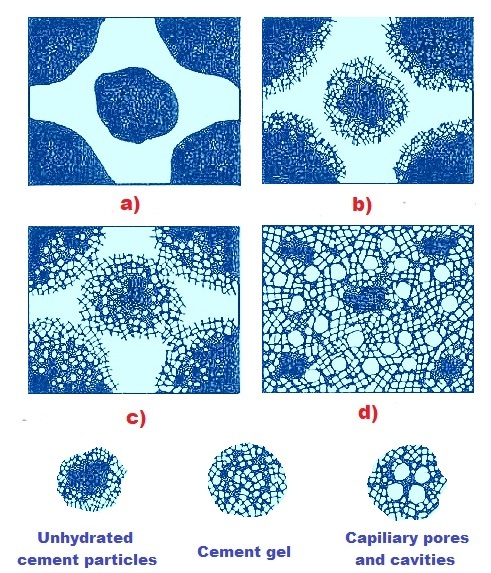 The average value of specific gravity of hydration product in saturated structure, inclusive of pores available in the possible densest structure, is 2.16. Here we are providing a demonstration of calculation of volume change during hydration. Example 1.0 is ideal condition, where hydration is assumed to occur in sealed container where no water movement is allowed whether into or away from the system. It is interesting to note that reduction in volume by value 5.9 stand for empty capillary pores dispersed in the hydrated cement paste. 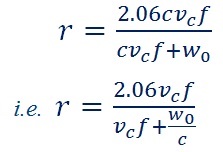 Relation between strength and water/cement ratio we know a reasonably low water/cement ratio will produce more strength, Too low water cement ratio may reduce workability and may supply insufficient water to hydrate significant fraction of cement incorporated in the mix. A too high water/cement ratio produces a porous structure leaving concrete of inferior quality both strength and durability point of view. But this relationship with water/cement ratio does not based on a well constituted law as water/cement ratio rule cannot be validated by proper qualification. We know a higher temperature at the time of placing of concrete and maintaining or allowing during setting, definitely increase strength at very early stage; followed by often adverse effect on strength at and after 7 days. This is due to rapid initial reaction that occur during hydration leading to formation of hydration product of poorer quality; a poor physical structure having more pores.Thus a significant portion of pores will always leave unfilled. According to gel/space ratio rule, the gel/space ratio will be lower in this case as compared to concrete that is hydrated slowly. The latter one will have less pores, thus resulting higher gel/space ratio. According to Verbeck and Helmuth, the explanation of low gel/space ratio due to high early temperature and subsequent adverse effects on later strength of concrete, is higher rate of hydration at initial stage under higher temperature inhibit successive hydration. . This is due to an irregular distribution of hydration products in the paste. Diffusion away of the hydration product, in this case, takes inadequate time from cement particles under initial higher temperature and cannot produce uniform precipitation into interstices of paste. Thus high density of hydration product is produced in vicinity of particles still waiting for hydration reaction or in state of some degree of hydration and inhibit subsequent hydration. As a result gel/space ratio will be less in the interstices and adversely y affects strength of concrete in the long run. Thus the local weakness in the concrete section will permit to progress cracks and results a lower strength of it as a whole. With the help backscattered electron imaging it has been confirmed that porous C-S-H exist in between hydrated cement particles. As per chemical composition, only gypsum content of cement is here prime concern. For a given cement, the gypsum content defines shrinkage and setting time of cement; but the gypsum content that is satisfactory in respect of shrinkage is found not adequate for establishing desired setting time. Gypsum is added to cement clinker during manufacturing process of cement and then final grinding of clinker is done. As discussed in above section about temperature, the initial structure produced during setting determines structure of cement paste at upcoming stages of hydration. Thus gel/space ratio is dependent on optimum gypsum content to facilitate hydration of as much as cement particles to gain strength and behavior of concrete under shrinkage and creep are also affected.